Yesterday I was talking with my friend about how my blog has been so writing and book-y lately. I’ve been spending a lot of my free time reading and writing, so this makes sense, but I’ve always enjoyed the fact that my blog was multi-faceted. Ideally every part of my life and all of the things I love could show up here at any time. So, in an attempt to put the “multi” back in “multi-faceted,” I am going to instate a posting schedule. Each day of the week will be assigned a category and on these days you, dear readers, can expect a little something that fits (perhaps loosely) within that category. This (probably) does not mean that I will be posting every day, but that when I do post, the post will fall under that day’s category. 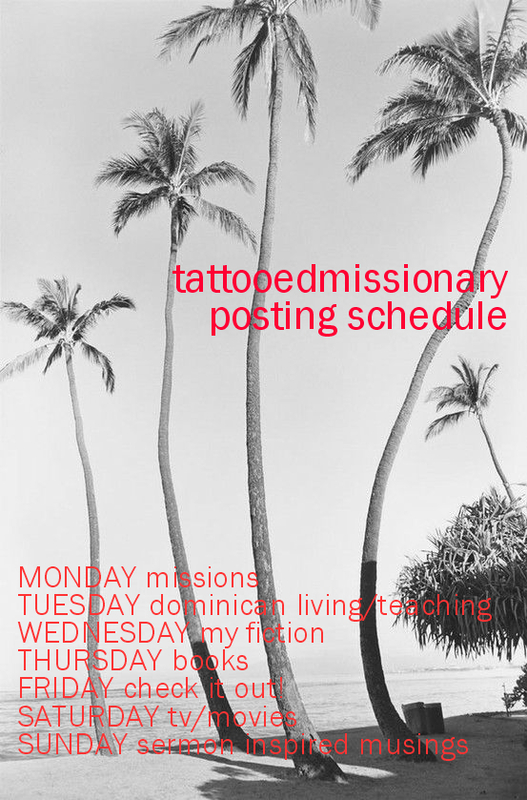 What this means for YOU is that if you do not really care about books (whether reading or writing them), but you are kind of interested in the Bible and Missions and Church, then you can only stop by on Sundays or Mondays. If you just want to talk about TV (let’s be friends), come around on Saturday and see what I’ve got to say about Penny from the Big Bang Theory (forthcoming) or join in as I compare the different CSIs. Thanks for the idea, Melissa!